This ocean-going superyacht combines a truly elegant appearance with extensive deck areas, catering for the entire spectrum of outdoor living requirements. 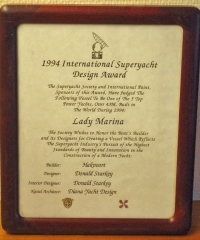 Lady Marina’s exceptionally stylish interior was created in cooperation with designer Donald Starkey. An exquisite blending of colors, textures and surface finishes is complemented by a delightful selection of art. 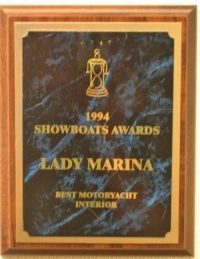 Lady Marina was the worthy winner of the 1994 Showboats Award for best motoryacht interior.